In the following screenshot, I have used the standard web part connections between the BeSmart Ltd document library view and the Visio Web Access control in order to set the Drawing URL. 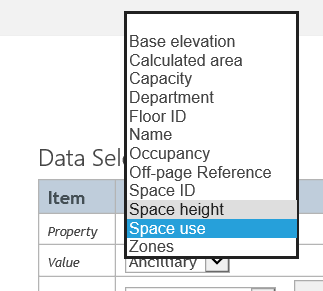 The Property drop-down list contains all of the Shape Data labels in the page … sorted, but not filtered. 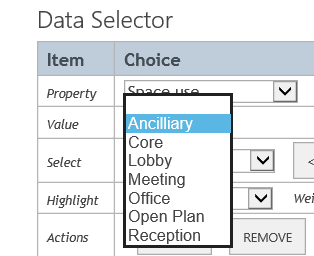 Then, the Value drop-down list contains all of the distinct values for the selected Property. The Select row then provides the ability to step through each shape in the selection. The Actions buttons provide the ability to highlight the set of shapes with a choice of colours. There is a little hit in time whilst the code collects the data labels and values, but this is only when a new page is selected. 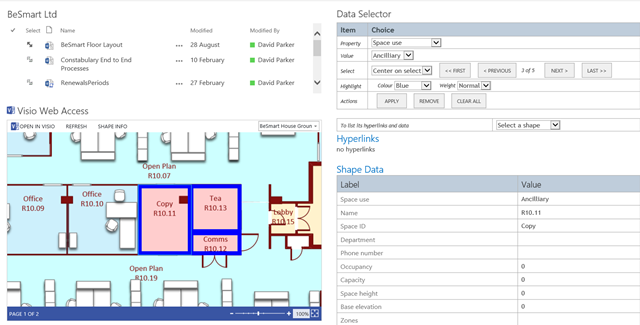 Post Script : I actually had the intention of making a new SharePoint App to do this, but that was before I learnt how difficult it is to communicate between the Visio Web Access control and the new App parts. Post Post Script : The code provides part of my Visio Services developer training course ( see http://www.bvisual.net/Services/VisioServicesTraining.aspx ).